How Much Protein is in Chickpeas? How Many Carbs are in Chickpeas? Bengal gram is the name of a plant of the legume family. Homeland of the chickpea is considered the Middle East region, where it has been cultivated for more than seven millennia. Garbanzo beans were widespread plants in ancient Greece and Rome, where this plant was considered a nice medical remedy. Now chickpeas grow in more than 30 countries of the world. The largest producers of this beans are India, Turkey, Pakistan, Iran, Mexico, Australia, Ethiopia, China and others (mainly tropical and subtropical). Mainly white-seed chickpeas are used in modern cuisines, but you can find black and green ones as well. There are plenty of different dishes with chickpeas, such as soups, garnishes, salads, snacks and of course the worldwide-known hummus. Considering mentioned, garbanzo beans should be very useful and nutritious. And they are. As we said, there are three the most famous sorts: green, white and black. All of them are different, and not only by color. Let us dive deeper and learn what each of Bengal gram types can grant you! Black and brown garbanzo beans are extremely popular in India, since this country cultivates the sort. You can find many Indian dishes where chickpeas are the main ingredient. That is because of its nice microelement content. Black Bengal gram contains more calcium, phosphorus and magnesium than a regular white one does. That is because of a different growth conditions. Thus, you would like to use this sort if you need some of these elements in your diet. On the other hand, there are not much vitamins in black chickpeas. We are talking about 2-5% of your daily intake, which is really scanty. That is why this sort is not that popular all over the world. For almost the same amount of calories as in a white one, you do not get enough usefulness. Green garbanzo beans are more popular than the previous sort for their low caloric value, as it is three times less. However, there are even less vitamins and microelements. These peas do not absorb much nutrients from earth. Green Bengal gram is more like regular beans. There is not more than 5% of your daily norm for all the microelements in green garbanzo beans. Of course, you can increase the percentage by boiling or roasting it with some additives. But then what is the matter of using this sort? White garbanzo beans are the most popular ones. Sprouts of these peas contain high-quality proteins, fats and fiber. There is a large amount of calcium and other minerals such as magnesium and potassium in its content. In addition, it contains a lot of vitamins A and C.
White chickpeas exceed other legumes by the number of essential acids: methionine and tryptophan. Talking about vitamins of group B, white chickpeas are the best. For example, there is more than half of a milligram of folate in 100 grams of raw garbanzo beans. And your daily intake is only 0.4 mg. Your body needs all of group B vitamins to let new cells grow and develop. These substances take part in all vital process, including tissues forming and blood circulating. If you want to save chickpeas health benefits for longer, you can dry them. This way no vitamins or minerals will be lost, and dried Bengal gram can be stored for years. It is also a nice idea to roast or boil chickpeas. There is a difference in nutritional composition, but most of useful structures do not change under heat treatment. The amount of them decreases, however. Chickpeas are a true dream of a nutritionist. There are even several scientific papers that justify the advantage of this plant over other sources of vegetable protein, soy in particular. Bengal gram contains both protein and carbohydrates in good amounts, and can be a universal food product. Chickpeas give human body a full set of essential amino acids. Therefore, this product is included in diets of vegetarians all around the world. The thing is chickpeas protein is digested somewhat easier than the one from regular peas. Therefore, flour from this plant is often used for cooking baby porridge. Moreover, 50% of a daily intake is just what sportsmen need to make their muscles grow faster. Even if you do no exercises, your body will appreciate a nice amount of completely digestible proteins. Green chickpeas, on the other hand, contain a lot less amino acids than white or black ones. This makes them even easier to be digested, but with no good use. Since chickpeas are highly calorized, the amount of carbs in them is also big. Thus, 100 grams of white Bengal gram contains a half of your daily intake. That is a lot, if you roast it and eat as a main dish. However, you can add chickpeas to some salads – then they will not take such a huge part of everyday consumption. Green garbanzo beans, which are not that much calorized, contain a lot less carbohydrates as well. You can eat these ones as is. By the way, it is popular to add canned chickpeas to dishes in order to make them taste better and be more nutritious. Fats are not that much in chickpeas. Considering there are only vegetable ones, it is no big deal at all. Garbanzo beans are unique for their vitamin content. You can barely find any other plant with such enormous amounts of some nutrients. 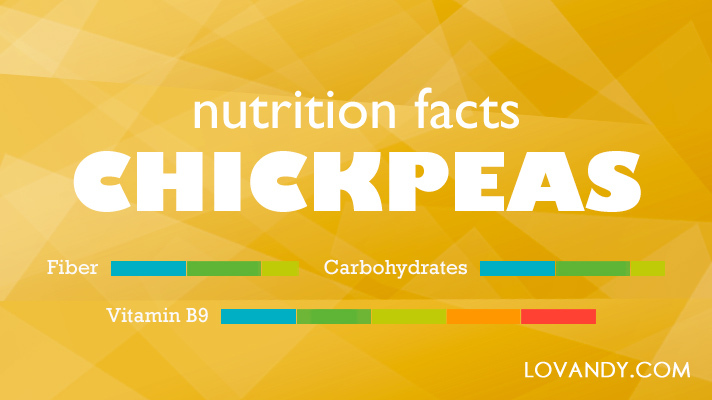 Chickpeas are really healthy and beneficial. They can replace meat in vegan diets and be a nice additive to any regular meal. Tell us about your favorite recipes with Bengal gram in a comment section!